Our recent commentary on 'Carmageddon', as well as in a number of previous posts, we've addressed the social and cultural issues that affect and shape our cities, buildings, and public spaces. Community is a term that can be applied and interpreted in countless ways, and even before it could be used in the context of technology and the online world, it was a subject of interpretation and analysis by a number of world-renowned architects throughout history. Developed in the early 30's, Wright's vision was a response to the industrialized cities of the era, and he espoused the use of the automobile and the 1-acre family homestead as central components to this utopian civilization. Criticized at the time by planners, there is still controversy now as to whether it was, in fact, a precursor to the suburbs in existence today. Imagine spacious landscaped highways… giant roads, themselves great architecture, pass public service stations, no longer eyesores, expanded to include all kinds of service and comfort. They unite and separate— separate and unite the series of diversified units, the farm units, the factory units, the roadside markets, the garden schools, the dwelling places (each on its acre of individually adorned and cultivated ground), the places for pleasure and leisure. All of these units so arranged and so integrated that each citizen of the future will have all forms of production, distribution, self improvement, enjoyment, within a radius of a hundred and fifty miles of his home now easily and speedily available by means of his car or plane. This integral whole composes the great city that I see embracing all of this country—the Broadacre City. The fundamental basis of this concept was that of a pastoral landscape founded on agrarian principles, with highways as the main mode of transportation between communities, homesteads and other necessary destinations. Recalling the garden city principles of the Arts and Crafts movement, Broadacre represented a rejection of urban life and a return to the land, where families utilized their allotted acre for food cultivation, enabling self-sufficiency and independence. Obviously, there are problems with this vision of the future, but it is fascinating to note that what we see as diametric concepts today were, at one time and from one perspective, complementary to one another. 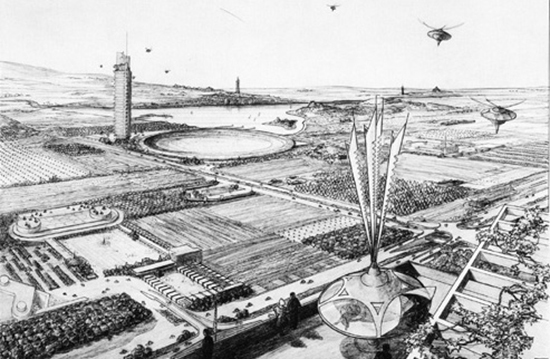 Ironically enough, we are seeing some of Wright's planning ideas in practice now with the increase in permaculture, edible landscapes and sustainable land use, even if these contemporary movements are in response to what could be considered possible repressions of Broadacre's other fundamental principles, such as the predominance of the car and low-density living. The decentralization of urban life and the increase of suburban communities is an topic that is incredibly complex, and the value of context cannot be highlighted enough, as this kind of ideological concept can be inherently conflicted when actualized in a specific time and space. The car culture Wright envisioned did not manifest itself in the way he had anticipated; instead of representing freedom, we often feel trapped by our reliance on the automobile, and the associated costs, financial, environmental and cultural. That said, it can't be a black or white issue, and certain elements of an idea can be useful in an open dialogue about community and development.